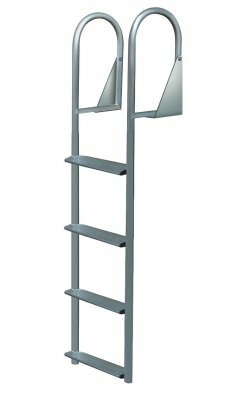 JIF Marine 5 Step Wide Step Swinging Dock Ladder, Wide 4" Steps, Anodized Aluminum. FREE SHIPPING! (Picture shown is 4 step model). 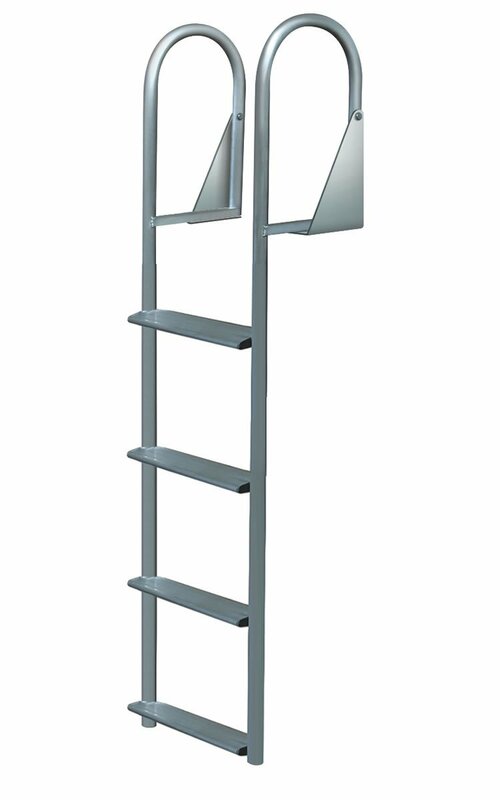 5 Step WIDE STEP Anodized Aluminum Swinging Dock Ladder. Constructed from 6005T-5 Anodized Aluminum. 22% Stronger than standard 6063 marine grade aluminum ladders on the market. More resistant to corrosion = longer life span of the ladder. Strong, no gap welding on steps and other parts. Pivot brackets allow ladder to swing 180 degrees out of the water. This helps reduce marine growth by keeping the entire ladder out of the water when not in use. Handles are bolt assembled to the all-welded UPS Shippable 2-piece design. Handles are removable, steps are all-welded and assembled with 2000 lb sheering factor stainless steel bolts. This helps reduce shipping costs. Comments: As advertised this is a great product that is easy to install and operate. We love it.